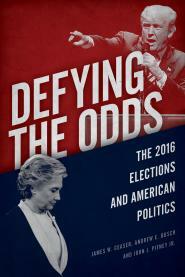 In Defying the Odds, we discuss Trump's role in the party system. The Trump White House stands at the doorstep of the 2018 midterm elections with no serious political operation. It's been a slow-moving train wreck, from the botched health care effort to the handling of Roy Moore's candidacy. And the man in charge of the political office, Bill Stepien, is seen by administration officials and conservative leaders as a non-entity — a situation senior Republicans blamed on Jared Kushner, who put him there. When I texted a senior figure at a powerful conservative outside group to ask him about Stepien, he called back and admitted he needed to Google his name before responding. "Nobody knows what the f--- he's done or is doing to advance the president's agenda politically," a senior administration source told me. "There's no follow through on initiatives." Stepien seems to have little sway over the RNC chairwoman, Ronna Romney McDaniel. She often deals directly with the president and White House chief of staff John Kelly. "Stepien's not the guy you pick up the phone and call," said a leader of a conservative outside group. "It just seems like the office is a non-entity. At most they monitor things. It's a completely passive operation." The initial meeting included Mr. Trump; Mr. Stepien; John F. Kelly, the White House chief of staff; Kellyanne Conway, the White House counselor; and Hope Hicks, the communications director. Also in attendance were Corey Lewandowski, Mr. Trump’s former campaign manager, and Brad Parscale, both of whom are advisers to America First Policies. Mr. Lewandowski aggressively criticized the Republican National Committee, as well as several White House departments, five people briefed on the discussion said. He told the president that his government staff and political advisers at the party committee were doing little to help him, three of the people briefed on the meeting said. He pointed to, among other thinned-out departments, the Office of Public Liaison. One attendee, speaking on the condition of anonymity because the discussion was intended to be private, said Mr. Lewandowski took pointed aim at the political operation led by Mr. Stepien. Another attendee insisted that Mr. Lewandowski lashed out at nearly every department but the political shop. Kelly has occasionally grumbled about the RNC and its chairwoman, Ronna McDaniel, advisers say. A number of senior advisers in the White House say that the RNC is not doing enough to defend the president and that its communications and political operation need to be improved — with more Trump loyalists installed. Meanwhile, they complain that Bob Paduchik, a Trump ally at the RNC, has suffered slights there. In turn, the RNC often finds itself at the whims of a president that can reverse on a dime, as he did in the Alabama special election for U.S. Senate that was won by Democrat Doug Jones this month. McDaniel has told officials at the RNC that her members are sometimes at odds with the White House. And the RNC was particularly frustrated by Alabama, where Trump agreed for the group to pull out of supporting Republican firebrand Roy Moore’s campaign but then backed Moore and forced the RNC to reverse its stance. Several White House officials said that they do not expect major changes at the RNC and that Trump continues to praise McDaniel in private. But there is talk of putting more Trump people at the organization or trying to take more control. An RNC spokeswoman did not immediately respond to a request for comment.